NutritionTalk: Sweet Potatoes - A Superfood! I wonder why people don't eat more sweet potatoes. Sweet potatoes are loaded with all kinds of vitamins, minerals, and fiber, but low in sugar, fat, carbohydrates and all the bad stuff. They were rated the number one most nutritious vegetable by the Center for Science in the Public Interest (CSPI). How is it that this vegetable, which has even been called a "superfood" and a "powerhouse of nutrition" , is rarely included in meals and are rarely used as an ingredient in recipes? 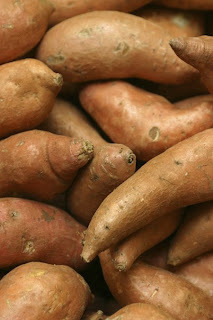 "Sweet Potato Ranks #1 in Nutrition by CSPI"